Franchisee Information – The Way, Inc. The way of the future is automation, and at TWI we have it. We have the new C1 Modular and Automatic Manufacturing Franchise Skid! If you have a personal passion for the best, newest, and smartest manufacturing technology available today, and an interest in supplying customers with the safest alternative cleaning systems that are proven to work, come and join the TWI family by investing in our newest C1 Modular Franchise Unit. You will supply your future employees with our tried and true cleaning products and solutions, and in return, you will receive the benefits of enormous earning potential. TWI franchise units supply cleaning products for use in heavy industries, as well as middle market small businesses. Use our wealth of heavy industry connections and business resources to help move your business adventure forward with limitless earning potential. The Way Inc., again also known as TWI, has been supplying heavy industries Bulk cleaning solutions for 28 years, with recent advances on DOT non-hazardous cleaners. We offer a turn-key business opportunity that covers sales training, chemical purchasing, an accounting package, chemical distribution systems and, of course, our Advanced Internet connected smart C1 Modular unit. At TWI, we understand that each market a franchisee encounters may require specialty cleaning solutions. We do not just provide a single product for all cleaning solutions, but specialty products that can be tailored to the region(s) and requirements by market segment groups. The Way Inc. Franchise Manufacturing Centers offer their customers the unique service of custom, low hazardous cleaning chemicals, manufactured through an Automatic C1 Modular Unit in quantities up to 750 gallons per blend, then delivered in Bulk ® into TWI supplied Bulk containers, or shipped in 275-350 gallon totes. 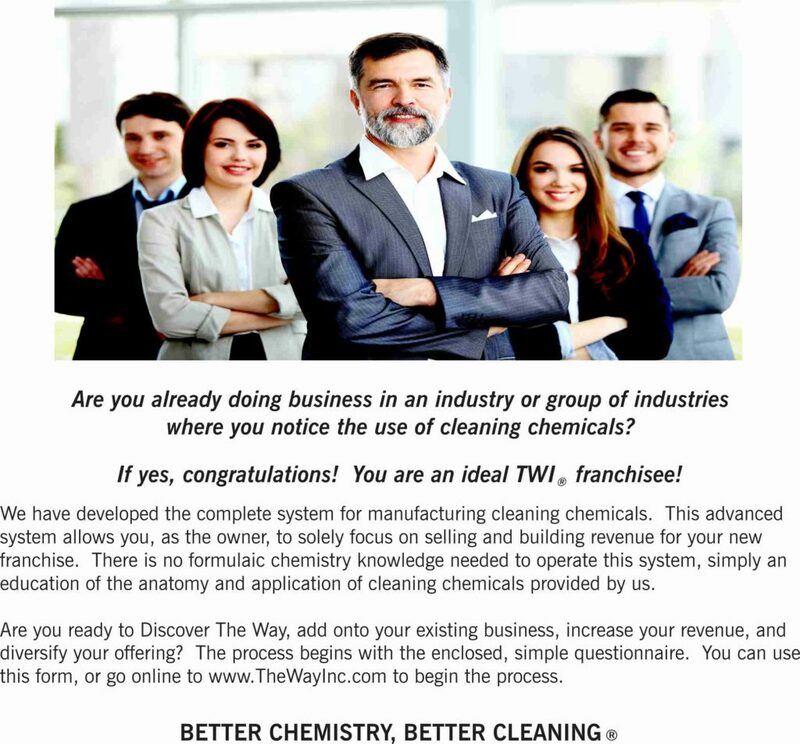 At TWI, a franchisee is allowed the authority to distribute The Way Inc.’s customized wide selection of environmentally friendly cleaning products and labor services. After paying a franchise registration fee, franchisee’s may use the TWI name and trademark. Range of Equity Capital (Up Front Monies) required: $275,000 – $476,000, although the cash investment may vary substantially relative to your individual market. Initial training* will be performed in Picayune, MS (*training included in franchise fee). Training will cover every aspect of your business, and as a turn-key operation. You will have access to our National Customer Base, as well as Labor Crew Safety Development, and Labor Service Development. All of these by a Master in Food Safety. For more information about our new and exciting turn-key manufacturing franchise available through The Way Inc., we encourage you to contact us at (800) 738-3707. We would love to answer your questions and assist you in discovering your future as a TWI franchise owner.